Retrans from Australian Olympic Committee: BIATHLON: Darcie Morton and Jethro Mahon have wrapped up their Lillehammer 2016 campaign with a 27th place finish in the biathlon single mixed relay at the Birkebeineren Stadium. In what turned out to be one of the most exciting events in Lillehammer, the Aussies finished 7:21.5 behind winners China who claimed the gold in a photo finish against the Norwegians. One of the many innovative events at the second Winter Youth Olympics, the relay featured two interchanges with Morton completing two circuits of the 1.5km course and two shoots on two occasions while Mahon completed two circuits and two shoots his first time out on course before finishing the race with two shoots and three circuits. In front of a packed grandstand of boisterous locals, Morton got the event underway for the Aussies and had six penalties in her two shoots in what were windy conditions before handing over to Mahon 1:36.0 behind in 20th place. The youngster from Melbourne continued to shoot well in Norway getting only one penalty in his two shoots as Australia fell back to 24th, 3:12.6 behind. Morton grabbed a place back for Australia as she clocked the 15th fastest time on her final run with five penalties as the Aussie team sat just over four minutes back. Mahon finished the race off, going clear on his first shoot and having three penalities on his second, as the duo finished in just under 49 minutes. Australia’s was one of only three nations to not have to ski a penalty lap in the event. The Australian Team at @lillehammer2016 has been cheering on their fellow team members. Biathlon team Jethro Mahon and Darcie Morton (athletes) and Luca Bormolini (coach), middle row at right end of the row, were very pleased to wave the flag for Madison Poole in the ice hockey skills final. The Australian Olympic Committee is issuing regular news reports on all Australians’ progress at http://corporate.olympics.com.au. It is a very exciting time for the Australian Team, where members have already bagged four medals over various events. 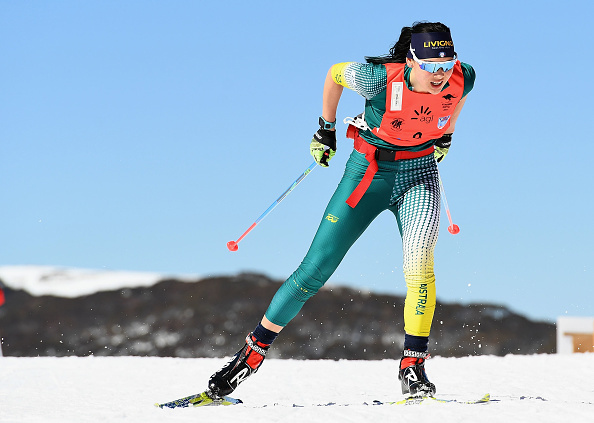 Today is the last event for Australia’s biathletes Jethro Mahon and Darcie Morton, who hit the snow in the Single Mixed Relay at 9:00 pm this evening Australian Eastern Standard Time. “Darcie Morton and Jethro Mahon return to Birkbeineren Stadium for their final event where they will need to work together if the Aussie underdos are to trouble their more fancied rivals. The pair will compete in the single mixed relay in which both athletes will shoot in both the prone and standing positions with Mahon skiing 7.5km and Morton skiing 6km. “I’m very excited,” said Melbourne’s Mahon. “Never in my life have I competed in a mixed relay so it should be good. “It should be quite interesting to see how we go as a team. It adds another dynamic to the race, will one racer be affected by the other’s performance?